I have been watching with interest the past week about the justified ire of patients being expressed all over patient groups in the internet. And in case you’ve been too busy with school starting or end-of-summer activities, it involves one of the nation’s largest mail order pharmacies as well as the largest Pharmacy Benefits Manager (PBM): Medco. 3) the shortage is due to this “uncertainty”. 2) Naturethroid by RLC Labs continues to be available. They are working hard to keep up. See my post on Naturethroid. 3) Desiccated thyroid was around long before the establishment of the FDA, so they are grandfathered in and still work with the FDA guidelines. 4) There has been no statements by the FDA that they are removing desiccated thyroid. There is actually an underlying message in the entire Medco fiasco that you should find even MORE disturbing: the continued promotion of T4, aka levothroxine, as an adequate treatment of hypothyroidism. And this is not just a faux pas of Medco, it continues to be the ignorant opinion of far too many doctors, medical schools and medical boards. All you have to do is look at what has happened in the UK with the Royal College of Physicians to see the idiocy abounding. Over 100 years ago, desiccated thyroid was found to be an excellent treatment for hypothyroidism. I give precise details about the first use of desiccated thyroid in Chapter 2 in the Stop the Thyroid Madness book. It worked! But in the early 1960’s, the tide turned thanks to a batch of desiccated thyroid that turned out not to be what it said it was. This is documented in the 1970 Pharmacological Basis of Therapeutics. And pharmaceuticals, especially Knoll Pharmaceuticals who first tableted levothyroxine aka Synthroid in 1955, jumped to promote T4-only as a “new and modern medication”. (See page 41 and 42 in the STTM book). And doctors and medical schools fell for it hook, line and sinker. And to this day, levothyroxine continues to be purported as an acceptable and logical treatment choice for hypothyroidism. But patients all over the world beg to differ. T4 medications like Synthroid, Levoxyl, Eltroxin, Oroxine and others simply leave all patients with their own unique amount and degree of lingering hypothyroid symptoms, no matter how high you raise it. I also find it hugely disturbing to refer to AACE (American Association of Clinical Endocrinologists) as if they are the grand poopah of knowing what’s right for thyroid patients. They are NOT. Millions of thyroid patients who have switched to desiccated thyroid, T3, or a combo of T4 and T3 will tell them hands-down that they have gotten FAR better results, and most especially with desiccated thyroid like the “old” Armour, and now Naturethroid. Visiting numerous thyroid patient groups will reveal how patients feel about Endocrinologists they have visited throughout the years. Their experiences are far from flattering. In other words, with a few exceptions, thyroid patients are NOT impressed with Endo’s. 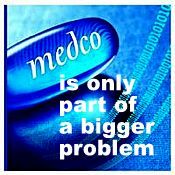 Medco’s statements are definitely a concern for patients and range from presumptous to unfactual. But those statements only represent a far wider problem around the world in the medical community. Clinical presentation and wisdom has been thrown out the window by doctors. So patients have to continue spreading the word about the far superior treatment of desiccated thyroid, and their problematic experience with T4. Want to be informed of these posts so YOU can be informed? Curious what’s on Janie’s mind? Use the Notifications on the left at the bottom of the links. ***50% off sale!! All STTM t-shirts are now on sale. I love sales. Not only do they help support this site, they are a great way to spread the word. Go here. Did you know that Laughing Grape Publishing will send a STTM book directly to your doctor? Hmm..everyone is all up in arms about the health care reform being another term for socialized medicine…..It’s here folks..and it’s been alive and well for some time in the hallowed chambers of the FDA! I struggled for almost 20 years with Drs telling me it was normal to gain 70 pounds in 3 months, have my hair falling out in clumps and needing more and more “depression meds”. My prayers were answered when I found a holistic female MD who started me on Armour and I got my life back. A “reformulation”? ………. More likely a forced “modification” that would cause Armour to lose its effectiveness and ultimately line the pockets of both the Synthroid CEOS and the zealots at the FDA.100 years Armour has helped millions of people like me who need both T3 and T4..and now I am awake at night wondering what next life saving medication from a smaller lab will be sabotaged. Disgusting , unthinkable, and very likely to cause deaths. Nice. they were probably ok you know, I think they have pulled the plug on those now too at the FDA, am I wrong? I was involved with a Medco issue over Armour Thyroid in June and they sent me a substitute called simply, Thyroid Tabs 1/2grain made by Time-Cap, they said Armour is no longer being made. I found a Rite Aid that had some but when I called in a refill they said Forest labs has discontinued making Armour and will not make it in the future. After reading comments I don’t know what to do. My pharmacist said he could possibly round up a few more tabs but that’s it. He said you’ll have to take Synthroid, only option. I continue to have symptoms, but thought maybe I needed a higher dose, but did have some relief on Armour. I have suffered for about 18 yrs and my ob-gyn gave Armour a try in spite of a thyroid panel that said I was normal. What is the truth, no more Armour or is everyone uninformed. I don’t believe what medco says and when I questioned the formulary for the substitution, they were very rude. I too have called multiple drugstores in the Kansas City area only to find that Armour is unavailable at the quantities required. I contacted RLC Labs also and they said they are out of the product because of all of the former Armour patients switching to Nature-Throid and Westhroid. UGH!!! Finally, I was able to locate Armour at a drugstore 30 miles away. I also contacted Medco (the bums) and they told me there is a nationwide shortage of Armour. After 10 minutes on hold, the phone answering person had spoken with the pharmacist and told me “They are trying to get people to move to synthetic drugs instead.” I then told them that we had already tried that route for 12 years of suffering and I would look elsewhere for help. So…… they ARE trying to get everyone onto synthetic worthless medication. After calling about 20 different drugstore I was finally able to find a CVS Pharmacy that had some Nature-Throid left. It’s been very tough and frustrating finding it. I had to drive 45 minutes out of my area to get it at this CVS. Most of the drugstores I contacted never even heard Nature-Throid! All they know is Synthroid. I just called RLC Labs and was told that Nature-Throid is on backorder for 90 days. My mom was diagnosed with Hashimoto while she was pregnant with me and allowed her doctor to remove part of her thyroid. She has experienced T4 only med symptoms since 1972 but thinks that this is normal. My younger sister and I are both low-thyroid, but my sister believes the TSH bloodtest and is not taking any medications. Is all this a coincidence – I believe not. My question is – I wonder if my mother having part of her thyroid taken out or having been diagnosed as having Hashimoto’s syndrome while she was pregnant with me – did that have an effect of me (or my younger sister)? The problem I’m having is that I am allergic to dairy. Nature thyroid has lactose in the inactive ingredients. Armour is the only one that I’ve been able to use without the allergic reactions (not lactose intolerant but a true allergy). So now I don’t know what to do since I can’t get anything. I’m totally out of my prescription and no-one seems to have an answer. Another part of my story is my 7 yr old daughter is also Hypo, she as DX at age 2 put on a T4 med only and dear god all kinds of problems starting arising, She had horrible behavior issues, didn’t feel pain,insomnia, tired, NO hair growing at all on head, arms, or legs, nails not growing, cold all the time, Low Basel Body Temp, I could keep going so from age 2-5 we had to deal with all this when I finally convinced a Dr to put her on Armour within 5 days things were changing she was becoming more like her younger sisters, She is still a handful but nothing like she was, Armour saved her life and is giving her quality of life, and I will fight tooth and nail to make sure we both stay Healthy. Doing whatever it is I have to do. ‘never heard of Nature-Throid’ or ‘it’s on backorder and will be here in 2 days’. NOT! I called RLC Labs and they were kind enough to give me names & telephone numbers of pharmacies that purchased Nature-Throid directly from RLC. There were two pharmacies in our state of Alabama. I contacted the first one on the list (in Birmingham), asked if they had it in stock, they said YES! The pharmacy called my local pharmacy, got the prescription transferred and I received my prescription the very next day. My insurance does not cover Nature-Throid. It was so worth the phone call to RLC Labs. I have a six-month supply on hand. Can you see me doing my ‘I’ve got my dessicated thyroid meds Happy Dance’? Call RLC! My doctor gave me a prescription for Nature-Throid yesterday. I’ve been on Synthroid for 18 years. I’m ready to switch but I called 3 pharmacies yesterday and they all told me ‘there is a shortage of Nature-Throid and we can’t get it’. Don’t know what to do… I guess I’ll have to keep taking this Synthroid crap until I find some Nature-Throid. How can you be so mean to the levothyroxine people! I loved going bald for four years on it when my doctor told me after my hypo diagnosis that there was zero connection between hair loss and hypothyroidism! Now that I’m on a desicated thyroid replacement regimen I have to deal with all of this extra hair that keeps coming in! Medco sent me a “generic” substitute for Nature Throid. The didn’t respond to my call or email. So, my doctor sent a new prescription to my local friendly pharmacy, who got the real Nature Throid for me, for 32 dollars for a 90 day supply. Our insurance dictates that we use Medco for any chronic need BUT it costs 30 dollars co-pay through Medco. For two dollars more, I get great service, total honesty, and a friendly person to talk to if I have questions – something totally lacking with Medco.